In 1999, the U.S. Consumer Product Safety Commission (CPSC) developed a report called the “Report on Electric and Gas Clothes Dryers.” In it, they stated that about 75 percent of households have a clothes dryer, which means that well over 75 million households in the U.S. have a gas or electric clothes dryer. The report also showed that in 1996 (as a sample year) more than 15,000 fires, 20 deaths, more than 300 injuries, and over $80 million in property damage occurred from clothes dryer fires. Of these 15,000 fires, electric dryers were shown to be more than 2.5 times more likely than gas dryers to cause fires. This is likely because the higher heat discharge from electric dryers exacerbates the problems of lint buildup. Fires originate most frequently from two places: dryer venting and the lint trap. Why these two places? Because clothes dryers are often improperly vented, and because those vents may not be properly cleaned on a regular basis. Although dry vent safety standards have been developed over the years, there is still considerable confusion about the types of dryer vent systems and how they should be maintained. Clothes dryer fires are by no means a thing of the past. Here are some basic dryer safety standards and some ways you can increase the safety of your dryer and vent system. Two voluntary sets of standards exist for dryer venting. For electric dryers, it is Underwriters Laboratories UL 2158. For gas dryers, the voluntary standard is ANSI Z21.5.1 (CGA 7.1). With these standards, rigid and semi-rigid metal vent pipes are the accepted ways to vent the dryer. Although metal pipe was always the preferred method of venting, most all of us remember the flexible white plastic dryer vent hose kit sold in hardware stores. As it turns out, these combustible white plastic hose kits are deadly when improperly used as dryer venting, and are the reason for many dryer vent fires. However, until recently they were still commonly used as dryer venting, and there are many homes that still vent their dryers using this dangerous product. It was not until December, 2006 that Underwriters Laboratories established UL 2158A “Clothes Dryer Transition Duct,” which is an approved standard for flexible high-temperature exhaust duct rated to 430 degrees F., which can be used on both electric and gas dryers. You need to exercise care when choosing this type of flexible metal dryer vent. When you go to the hardware store, you may see flexible duct that is labeled with a UL listing of UL 181B “Closure Systems for Use with Flexible Air Ducts and Air Connectors.” However, this standard is for flexible plastic and metal heating and cooling ductwork, and for vent fans such as those used in bathrooms. These products are not approved for use as a dryer vents. Only flexible ductwork meeting UL 2158A can be used as dryer venting. An even better solution than any type of flexible metal ductwork is rigid metal ductwork, since it has no inner corrugations that can trap lint. The Consumer Product Safety Commission developed CPSC Document #5022, which outlines actions you can take to reduce the risk of dryer fires from overheated clothes dryers. Check the outside dryer vent while the dryer is operating to make sure exhaust air is escaping. You should feel a strong discharge of moist warm air. If you do not feel a strong discharge of air, the vent or the exhaust duct may be blocked. It may be necessary to disconnect the exhaust duct from the dryer to remove a blockage in the exhaust path. Disconnect the ducting and inspect for blockage. If the duct has lint buildup, clean the duct. Remember to properly reconnect the ducting to the dryer and outside vent before using the dryer again. Clothes take longer and longer to dry. Clothes are hotter than normal at the end of the drying cycle. The outside of dryer gets very hot. The outside exhaust vent flapper does not open very much, indicating low exhaust velocity. Laundry room becomes more humid than it is usually. A burnt smell is evident in the laundry room. To clean the lint trap, first remove the lint trap filter from the dryer and clean it. This must be done before or after each use of the dryer. Also, vacuum the lint trap housing cavity monthly. You should make a point to clean behind the dryer where lint can build up. Once every couple of years, have a qualified service person clean the interior of the dryer chassis to minimize the amount of lint accumulation. 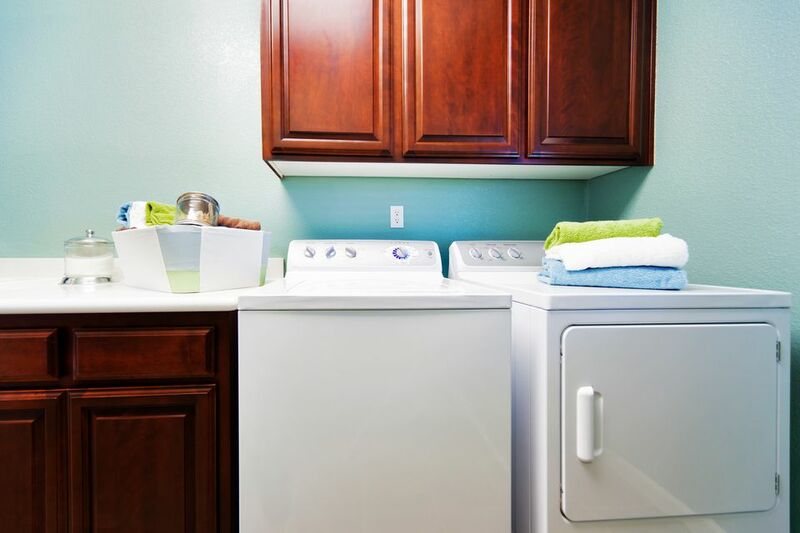 Keep the area around the dryer clean and free of clutter. You can see here how much lint can build up behind a dryer, where it can get very hot. Make sure to replace any plastic or metal foil, accordion-type ducting material, as plastic is not approved for dryer use and some metal foil ducts may not be approved, either. You must replace these ducts with rigid duct or corrugated semi-rigid metal duct meeting the UL 2158A standard. You'll find that most dryer manufacturers specify the use of a rigid or corrugated semi-rigid metal duct, which provides maximum airflow. Flexible plastic ducts are flammable, and they, along with foil-type accordion ducts, more easily trap lint and are more susceptible to kinks and crushing, which greatly reduces or obstructs the dryer air discharge.